A new crop management system from Syngenta is revolutionising pest protection methods among vegetable growers. Applying insecticides through the year can be an unpleasant task but is absolutely essential with vegetable crops subject to constant attack from a wide range of chewing and sucking insect pests. Day-to-day management just got a whole lot easier thanks to the introduction of a revolutionary new crop management system called DURIVO from Syngenta. DURIVO is a unique soil-applied insecticide that provides long-lasting protection against an army of grubs, aphids, thrips and other pests in early stage vegetable crops. According to Syngenta, a single treatment at planting protects young plants for up to 40 days, eliminating the need for up to eight conventional foliar sprays required with conventional pesticides. In addition to excellent insecticidal properties, DURIVO produces a visible vigour effect on young plants, allowing them to grow to their full genetic potential. Since only tiny amounts of the insecticide are required, potential spray exposure for workers is reduced, delivering significant benefits for consumers and the environment. Lockyer Valley vegetable grower, Rick Sutton used DURIVO on his farm last summer with good results. 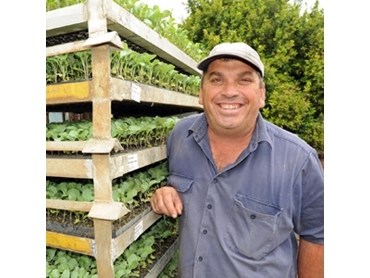 His business, Sutton Farms produces tomatoes year-round in addition to pumpkins and watermelons in summer as well as lettuce, broccoli, celery and wombok in winter on 320 hectares in the Gatton district. Withcott Seedlings staff applied DURIVO at just 0.05mL per plant to 7000 tomato seedlings before delivery. Farm manager Neal Dionysius says that the insecticide worked for the 32 to 36 days that were required. He adds that the treated plants stood out heads and shoulders above the alternative treatment, looked a lot healthier with a stronger bush as well as dark green foliage and also grew far more vigorously. Neal reckons DURIVO will significantly reduce Sutton Farms’ dependence on insecticide while saving time on spraying and freeing up the workers for other chores. Neal says that DURIVO makes life so much easier during the critical first month of the growing cycle.